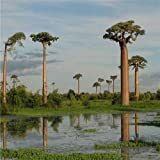 Baobab tree growing tree succulent of the genus Adansonia also known as Adansonia Baobab tree, Baobab tree perennial deciduous used as ornamental plant as shade tree or as bonsai, can grow in tropics, mediterranean or subtropics climate and growing in hardiness zone 10+. Leaves color green in elliptic shape the leaves connected in the base 5 leaves. Flower color white, there are five petals and the stamens in ball shape, the flowers hang from the tree down. Fruit color is brown when mature in oval shape, inside color is white structure that mostly used for the health medicine and there are seeds inside. 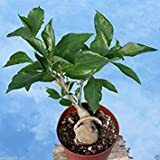 10 Baobab Seeds, (Adansonia Digitata), Monkeybread Tree, Grow Indoor or Outdoor ! 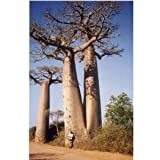 10 Baobab Seeds,(adansonia Digitata),monkeybread Tree,grow Indoor or Outdoor !